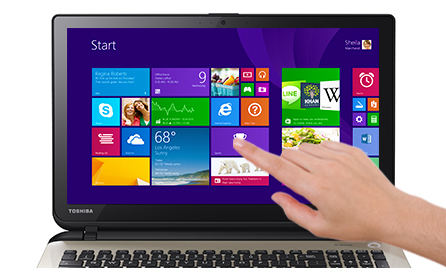 Toshiba Satellite L50D-B-1C4 15.6" Multimedia Laptop AMD A8-6410 6GB RAM 1TB HDD. These are Official Toshiba Recondition units in A+ condition. They'd be professionally refurbished & Tested by Toshiba Engineers.Cosmetically they would usually be in nearly new condition with very light marks / scratches that would not hinder the functionality in anyway. Note : Picture are only for illustration purposes only. Please refer to technical specs for exact model and details. Available in Red Colour. 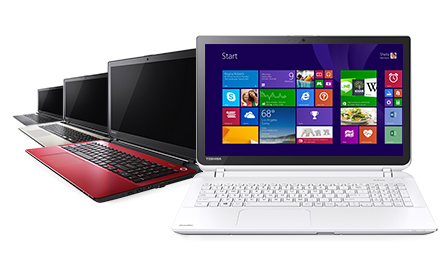 The Satellite L50D-B is designed to be super-slim in size, but big on features. Its distinctive new looks offers comfortable, tactile feedback, thanks to a frameless tile keyboard and large click pad. 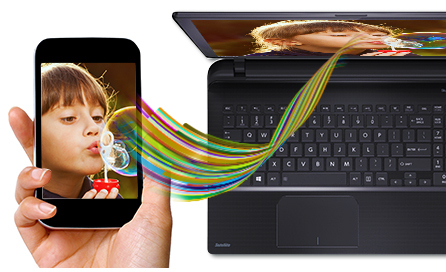 And at just 23mm thin*, with a choice of four elegant colours, you will want to take the L50D-B everywhere. With the Skullcandy tuned speakers combined with DTS® Sound, your audio will be richer, deeper and more vibrant than ever. These built-in speakers create a well-balanced soundstage, so you can immerse yourself in realistic surround sound every time you stream a movie, watch a video, play games or listen to music. Turn all your favourite applications into exciting interactive experiences, by choosing a Satellite L50D-B with an optional 10-point touchscreen display*. Instinctively simple to use, and Windows 8.1 optimised, you can scroll, drag, swipe, pinch and zoom making it really easy to work, explore and play. Fully immerse yourself in your favourite movies and online content, thanks to the Satellite L50D-Bs 15.6 display and choice of integrated AMD Radeon R series graphics*. 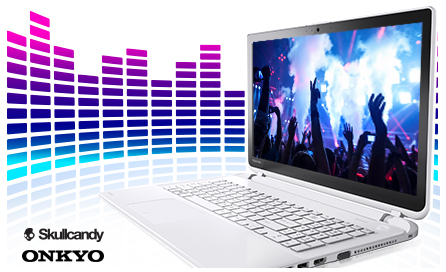 You can see everything clearly on the HD screen on your laptop, using the L50's HDMI-out port. To ensure the picture is super-sharp at all times, Toshibas built-in Resolution+ technology will enhance the quality of your video and photo content in real-time. Wireless display technologies allow you to seamlessly share content between devices, such as TVs and projectors. The Satellite L50D-B also comes with one USB 2.0 port, two USB 3.0 ports and Bluetooth 4.0, making it quick and easy to transfer large data quickly to your other devices, upload your camera photos, share movies and sync your mobile devices wirelessly. You can even recharge your phone or MP3 player without switching your laptop on, with USB Sleep-and-Charge. Or connect to HD TVs and displays with HDMI.